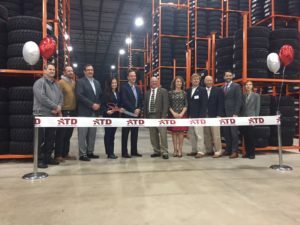 Blakeslee – Officials of American Tire Distributors welcomed guests to their brand new 1 million square foot facility in the New Ventures Commercial Park, Blakeslee to celebrate the opening of their new Mixing Warehouse on Wednesday, November 7, 2018. American Tire Distributors (ATD) is one of the largest independent suppliers of tires to the replacement tire market. 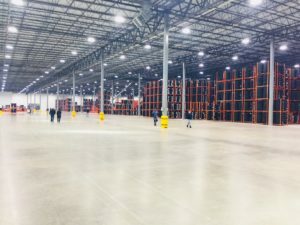 It operates more than 140 distribution centers, including 25 distribution centers in Canada, serving approximately 80,000 customers in across the US and Canada. The new Pocono Mixing Warehouse will be led by General Manager, Jennifer Green and will be staffed by 70 full-time associates. The warehouse also added $70 million to the local economy and created nearly 150 construction jobs. The facility will receive and ship more than 2.5 million tires per year, receive more than 3,500 imported containers and ship more than 3,500 full truckloads to their 40 distribution centers and customers. Why was this site selected? Blakeslee is strategically located in close proximity to the New York/New Jersey port of entry and one of North America’s most densely populated regions in the northeast United States. The facility’s proximity to the distribution centers it will service allows their already industry-leading supply chain to better serve customers in the northeast and mid-Atlantic United States as well as southeast Canada, giving them the opportunity to grow market share and help customers thrive and drive into the future.